You Can't Judge A Celery Root By Its Looks The humble celery root probably won't win any beauty competitions. But if you push past its gnarled appearance, you'll find a tuber that's packed with flavors. It's raw crispness is perfect for a winter salad. When cooked, celery root delivers a nutty sweetness with a warm, buttery, earthy quality that is endlessly malleable. Get recipes for Celery Root And Potato Latkes, Truffled Celery Root Mash, and Celeriac And Lentils With Hazelnut And Mint. Imagine how celery root feels at the vegetable beauty pageant. Everyone's falling over the tomato, that smug beauty queen. The cameras love elegant long carrots and parsnips, and the radishes blush in the spotlight. People coo over the potatoes even though they're not much to look at, because they're in it for the fries. 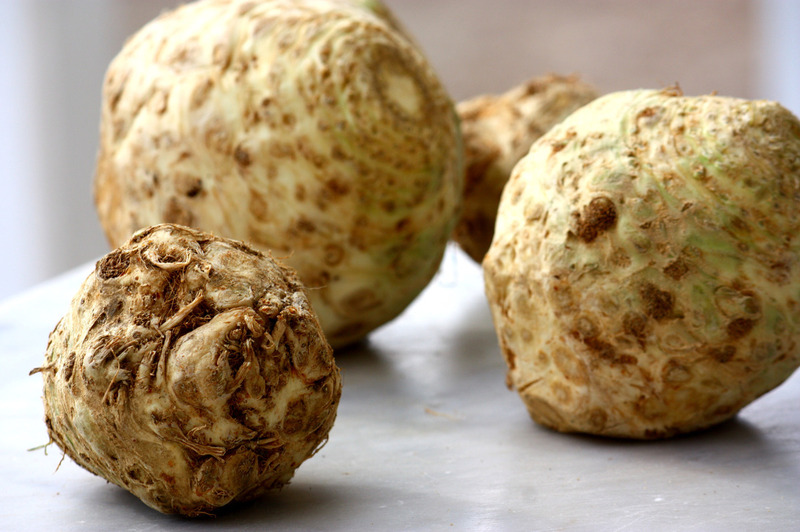 But homely celery root hovers by the concessions table with big, unremarkable rutabaga and antennaed kohlrabi. The fact is, celery root devastatingly combines the unfamiliar with the unprepossessing — all gnarly tendrils and clod-like form. But the celery root has a big, fabulous secret, and that is its taste. Despite its name, celery root is not the root of the crisp, linear celery stalk once so sanctified by dieters. (Calling it "celeriac" circumvents this confusion, but I think it makes it sound like a medical condition.) It is a roughshod cousin whose flavor resembles that of the puritan stalk that graces countless crudite platters — but only a little. The celery flavor of celery root is a luscious, creamy, heaven-can-wait kind of celery flavor with no strings attached. To unlock the flavor, though, you must first approach the monster and disassemble it. Take your courage in both hands, along with a good serrated knife — a sturdy bread knife does wonders. Ruthlessly saw off the gnarly roots and whiskered patches, repeating to yourself as often as is necessary, Steady on, it's only a plant. You can stop just as soon as you've gone past the skin, no matter how odd-shaped your remainder. If you find yourself with something that looks like a cue ball, chances are you've gone too far. There are those who enjoy raw celery root, and if you are one of them I congratulate you. Once you've done away with all the hairy protuberances and reduced the celery root to an irregular, ivory polyhedron, you have only to shave off or julienne some fine slices and you're practically done. A dollop of grainy mustard vinaigrette along with maybe some crisp, complementary apple and you have one of those brittle but elegant, nutritionally virtuous "winter salads." Not being a great one for virtue, I most enjoy celery root warm, its sweetness and subtle nuttiness coaxed out and cosseted with luxurious starch. Cooked celery root has a buttery, earthy quality that's not unlike Jerusalem artichokes (or artichoke heart itself, for that matter). 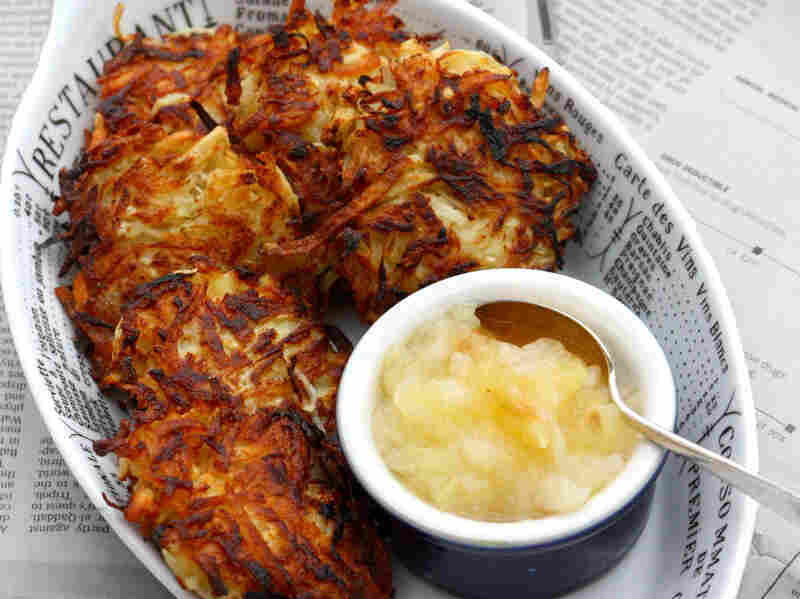 It pairs beautifully with russet potatoes in almost any form, whether grated and transformed into surprising latkes, or sweet-talked into a silky mash. I'm willing to bet it won't be long before you come to adore the homely celery root for its inner beauty. It takes a quiet turn at stardom at those sprawling, hours-long holiday spreads, where scraping sounds at the bottom of the bowl are a testament to its appeal. And afterward — as satiated selves are lowered onto sofas, ties are loosened, and buttons are popped — well, I think we can all agree that appearances are seriously overrated. These are adapted from the terrific Gourmet Today (Houghton Mifflin Harcourt, 2009). I usually start grating them by hand as the recipe suggests, and then get fed up and pull out the Cuisinart. It works either way. But the authors point out that the machine makes longer shreds than the grater, so you need a little more egg for binding. I usually run my kitchen scissors through the machine-grated mass of shreds a few times to shorten them, which seems to help. This is one of the most comforting ways I know to eat celery root. 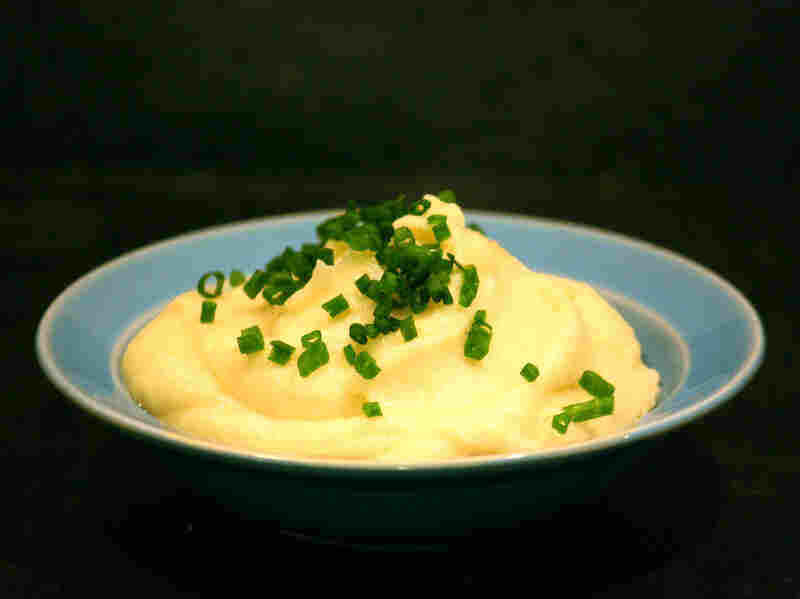 You can simply mash it with a regular potato masher, but for the silken puree that is one of celery root's side benefits, the food processor is the way to go. Place the potato chunks in a large pot with enough generously salted cold water to cover the potatoes with 3 inches to spare. Bring to a boil. Add the celery root chunks and simmer together until the vegetables are all quite tender, about 15 to 20 minutes. Drain into a colander placed over a serving bowl large enough to accommodate the mash (so the boiling water warms up the serving bowl). If using heavy cream, microwave or heat in a small saucepan until just hot. In a food processor, purée the potatoes and celery roots together until you achieve a smooth puree; you'll need to do it in 2 batches. When the first batch is finished, turn it into the warmed serving bowl. While puréeing the second batch, add in the hot cream or sour cream. Add the truffle oil to taste and turn the second batch into the warmed serving bowl, folding it into the first. Adjust the seasoning, sprinkle with chives, if using, and serve immediately. This surprising side is adapted from Yotam Ottolenghi's Plenty (Chronicle Books, 2011). Londoner that he is, Ottolenghi advises you to cut the celeriac into "chips." That's British for "fries" so don't break out the mandoline. Judging by the picture, I cut them into about 3/8-by-3/8-by-2-inch batons, and they came out just about perfect. 1 small celeriac (about 1 pound), peeled and cut into 3/8-inch "fries"
Preheat the oven to 275 degrees. Scatter the hazelnuts on a small baking sheet and roast in the oven for 15 minutes. Let them cool down then chop roughly. Combine the lentils, water, bay leaves and thyme in a small saucepan. Bring to the boil, then simmer for 15 to 20 minutes, or until al dente. Drain in a sieve. Meanwhile, in a separate saucepan, cook the celeriac in plenty of boiling salted water for 8 to 12 minutes, or until just tender. Drain. In a large bowl mix the hot lentils (if they have cooled down they won't soak up all the flavors) with the olive oil, 2 tablespoons of the hazelnut oil, the vinegar, plenty of salt and some black pepper. Add the celeriac and stir well. Taste and adjust the seasoning. 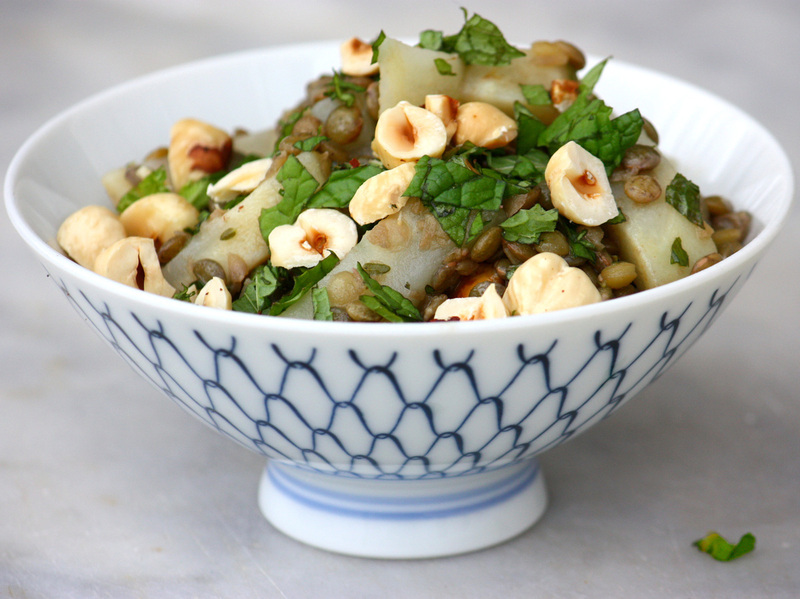 To serve right away, stir in half the mint and half the hazelnuts. Pile onto a serving dish or in a bowl and drizzle the remaining hazelnut oil on top. Garnish with the rest of the mint and hazelnuts. To serve cold, wait for the lentils and celeriac to cool down, then adjust the seasoning or add some more vinegar, if you like. Add hazelnut oil, mint and nuts in the same way as when serving hot.